So far, the Los Angeles Motor Show has been creeping up on us with a raft of concepts, striking ideas and new technology. That doesn’t mean that the sort of car you actually buy won’t be seen in Los Angeles. Perhaps one of the prime examples of this would be in the launch of the refreshed 2011 Acura TSX. Also known as the Honda Accord, the Acura TSX is probably one of the most mid ranged of the mid range of family saloons and estates. 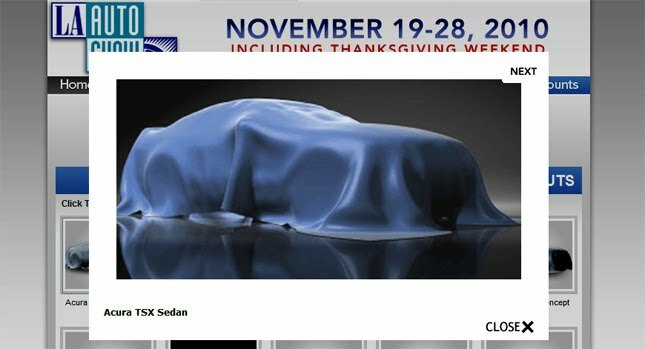 Now Honda has already announced a new electric concept of sorts for LA, what could they possibly have in store for the 2011 Acura TSX? I’m thinking not much. This is because the latest iteration of the Acura TSX came out just two years ago so don’t expect more than a facelift. Even if it’s just a facelift don’t expect many changes as they probably won’t happen. Perhaps it’s not just a facelift. It could actually be a reminder of The Acura TSX Sport Wagon the Japanese revealed back in April at the New York Motor Show. Basically we’ll just have to wait and see what part of the Acura TSX goes 2011 over in L.A.